This product is available in original, spicy chilli and garlic flavours stored in both tins and jars. All of the baits are cooked inside the packaging so that all of the oils and natural attractants from the hemp are retained and no preservatives are added so you are getting a totally natural bait. The 2.5l jars are ideal for long sessions or when you know you will need a lot of bait and the 700g tine are perfect for storing in your carryall or rucksack just in case you might need them. 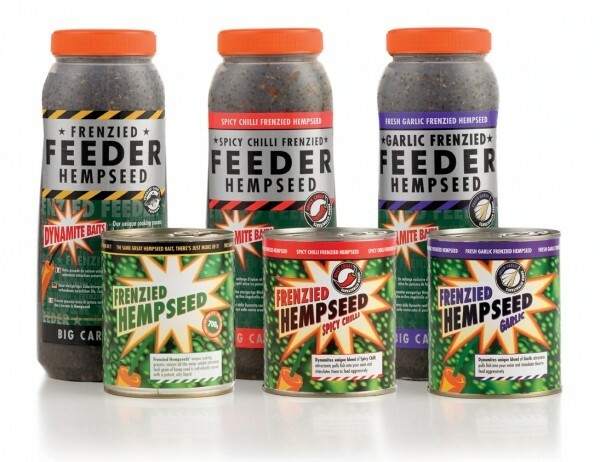 Frenzied Hempseed is now also available in smaller 350g tins which are ideal for short sessions or when you don’t need much bait. Looking to buy some Dynamite Baits as part of a fishing gift? If you would like some advice on purchasing Dynamite Baits, simply contact our expert fishing team, giving us either an email or phone number on which to contact you and we'll get back to you right away with the best advice and prices. FREE Delivery on all Dynamite Baits Dynamite Baits over £100!! !